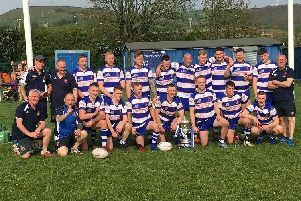 Siddal suffered a second successive defeat at the start of their National Conference League campaign when beaten 32-12 at home by champions Hunslet Club Parkside yesterday. They had emerged with plenty of credit from the previous weekend’s 22-0 Challenge Cup defeat away to Workington’s professionals but were unable to back up that performance. Hunslet had made a mixed start to the season, after a superb 2018-19 campaign, but they were well organised and improved as the match went on. The first half was a close affair as defences dominated on an excellent playing surface. Hunslet went ahead after nine minutes with a converted try and had long periods of pressure as they used their size well. Siddal were defending their line like lions and repeatedly repelled the visitors. They then broke out and had a good spell of pressure. Debutant Alfie McGrevy went close and from the next play the ball was passed wide for Josh Greenwood-MacDonald to squeeze in at the corner. Chris Brooke levelled the scores with the conversion. Hunslet gained a vital lead in added on time at the end of the first half when Jamie Bradley touched down by the side of the posts and Andy Hullock added the conversion. The visitors were quickly out of the blocks in the second half and tries from Omar Alrawi and Marcus Elliott, the second converted by Hullock, put Hunslet 22-6 ahead. Siddal reduced the deficit after a bright patch in which Gareth English found an offload to put Freddy Walker in the clear and set up the position from which Iain Davies touched down under the posts. Brooke’s conversion closed the gap to 12-22, but further tries from Alrawi and Josh Murphy, plus a Jamie Fields conversion, gave Hunslet a comfortable win.